Here’s our all-time favourite veggie dish! It’s a guilt-free addictive snack that’s super easy make – especially fun to put together. Chef Saiphin learned how to make this dish for the first time when she was living in Hong Kong. 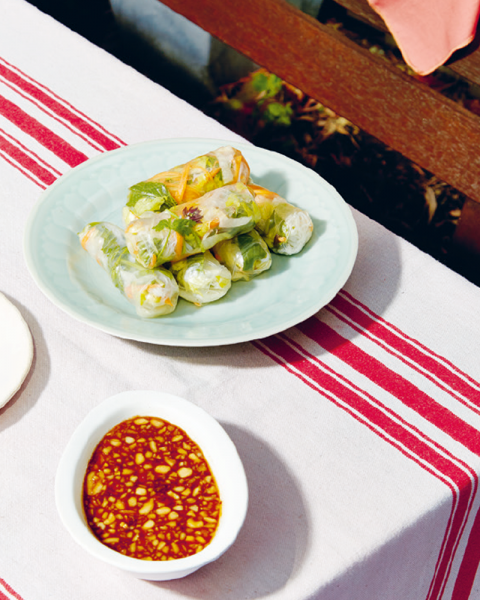 Although traditionally, fresh rolls in Vietnam are made with shredded pork or prawns, she’s perfected this vegan version using the peanut sauce as a protein source in the wrap. Feel free to modify the recipe and stuff them with any mixed leaves you prefer. Because the rolls have a mild flavour, you can dip them in sweet chilli, peanut sauce, or even tamarind sauce. FOLD. TUCK. ROLL. To make the rolls, fill a large shallow bowl with warm water. Take a sheet of rice paper and dip it into the water for 3-5 seconds, until translucent, then place it on a clean work surface. Tips: Make sure the paper rolls don’t become too soft, otherwise you won’t be able to wrap them easily. 5 seconds in warm water max! Put a quarter of the lettuce in a mound in the centre of the paper, followed by a quarter of the carrot, mint, coriander, basil and vermicelli. To roll up, fold the side of the wrapper closest to you over the filling, ensuring it is tucked in neatly and tightly over the filling. Next, fold the right side of the wrapper toward the centre, pulling it taut across the filling, and press down the edges of the wrapper to seal. Repeat with the left side. Now roll up the filling in the wrapper, pushing the roll away from you, to create a log-shaped parcel.